It’s hard not to be inspired by SpaceX and its billionaire founder Elon Musk. The company is taking on the extraordinary task of making humans a multi-planetary species by initially building a city on Mars. SpaceX has recently reflown the first “flight-proven” orbital rocket in history and even reused the Dragon spacecraft. These advancements will make it possible (and financially feasible) to carry out a human mission to Mars. SpaceX’s progress has inspired many in the space industry but also photographers, journalists, and even a few talented artists. The Observer reached out to one of those artists, Jon Ross. Ross is the owner of ZLSA Design where he creates spacecraft art and infographics that are both as accurate as they could be given the data available, and inspiring. What inspired you to create these incredible SpaceX images? SpaceX didn’t publish lots of material about how their hardware actually functioned, and I saw lots of questions about it from people who were new to SpaceX. Instead of answering these questions when I saw them, I made infographics that I could link to that would visually demonstrate the concepts at play. My most-viewed infographic is probably the one I made right before the launch of Orbcomm OG2 M2, to show the approximate trajectory the Falcon 9 booster would take for the RTLS landing attempt. And the art thing kind of happened by mistake. I’d used Blender for a long time (before I’d even heard of SpaceX), and I modeled a Falcon 9 for practice. I started to place it into scenes (such as the ASDS scale image), and after a while, I realized that I could render things that didn’t yet exist. After I rendered the ASDS scale image , John Gardi contacted me, wanting to collaborate on an article about SpaceX’s landings. He wrote the article, then we both edited it, and I rendered a few scenes of the Falcon 9 landing, to be used as wallpapers. It was quite popular. After that, I started posting other illustrations of SpaceX hardware, while continually improving my 3D models.I also started rendering more of SpaceX’s future plans, like the Red Dragon and the SpaceX Mars rocket. If people look at my illustrations and are excited for the future, then I’ve done my job. Out of everything SpaceX has planned for the future, what’s the most exciting to you? This one is pretty obvious: colonizing Mars. I want to see humans living and working on Mars, and I want to do anything I can to educate people about it. It’s something that’s technologically possible, and it should appeal to the human urge of exploration. Even landing a human on Mars will be a massive endeavor, and colonization far more so; but I can think of nothing as encouraging as trying to colonize another planet. Has SpaceX CEO Elon Musk seen your work? Back in 2014, after CRS-3’s ocean landing success, Elon Musk tweeted a low-resolution picture of their Autonomous Spaceport Drone Ship, named “Just Read The Instructions”. It’s quite a large ship (the landing pad itself 300 feet long and 160 feet wide), but there was no indication of scale. So I quickly built up a model of the droneship and placed my Falcon 9 model on it, then posted the render to r/SpaceX. How much time goes into creating these pieces? I can draw the simpler infographics in about an hour, but the research is the slow part. The more complicated infographics require custom vector art, which can take a lot longer; it took several days to create all the SpaceX ITS infographics, for example. My illustrations take much longer to make. Once I have the 3D model, I need to build the scene, then render it. This can take several days. How do you get the information for your infographics? 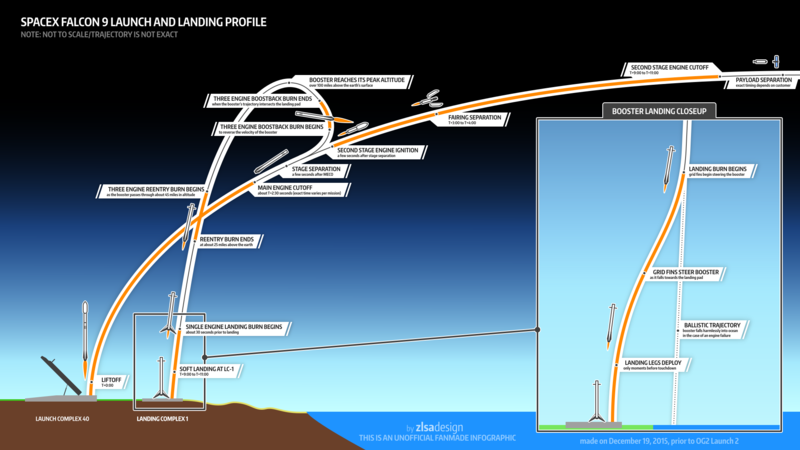 For my Falcon 9 booster trajectory infographics, I’ve found Flight Club to be an incredible resource. It’s basically a rocket trajectory simulator, and while the trajectories there aren’t based on the actual trajectory (which isn’t public), it’s still constrained by physics, which means the manually-created trajectories are quite close to their real-life counterparts. Which is your favorite piece that you’ve done? My favorite infographic is probably the one about Falcon 9’s Control Methods. I personally feel that it explains a rather complex set of hardware in a clean, concise, and easily-understandable way. Plus, I like the way it looks. My favorite illustration is probably the Falcon 9 booster landing on the droneship. It’s the first illustration where I painted over the raw render (to improve the flame and add the smoke), and I think it turned out pretty well.